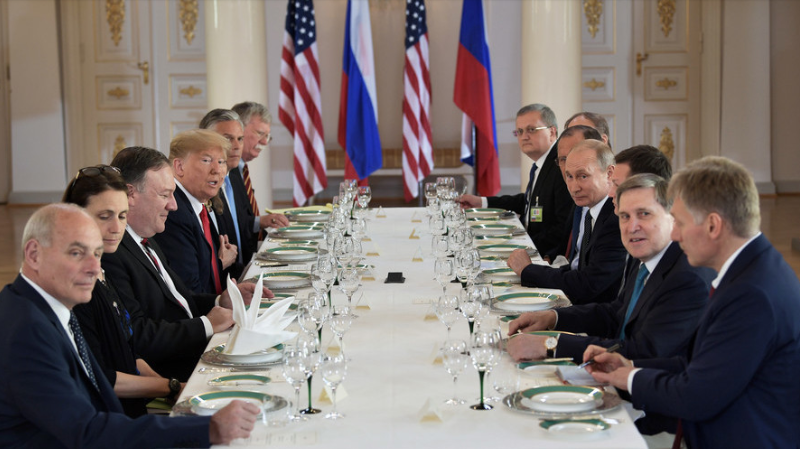 President Vladimir Putin’s side of the brunch table at the Helsinki summit almost matched President Donald Trump’s side. Seven sets of knives, forks and spoons; six officials, one interpreter, matching lieutenant-generals. The odd man out — that’s to say in — was Dmitry Peskov, the Kremlin spokesman. Peskov’s White House counterpart, Sarah Huckabee Sanders, was excluded. Peskov wrote notes during the delegation meeting; his contribution became public during the press conference of the two presidents which followed. Watch the conference and read the Kremlin transcript in English. Prepped by Peskov, Putin began at Minute 31 to “suggest that your relevant commission led by US Special Counsel – what is his name, Mr Mueller or Meller? – should send us, in compliance with this treaty, an official request for interrogating the people that he believes to be guilty of committing a crime. Our Prosecutor-General’s Office and investigative agencies can interrogate these people and forward the relevant materials to the United States. “Moreover, we can take another step to meet you halfway. We can allow US official representatives, including those from the Mueller-led commission, to be present at the interrogation. Certainly, in this case, we will be seeking reciprocal steps from the United States. We’ll expect the American party to interrogate the officials, including the US intelligence officers, who are suspected of committing illegal acts in Russia, in the presence of our investigation officers. “I mean the high-profile case, involving [Bill] Browder’s Hermitage Capital company. According to our investigative officers, a group of people – Mr Browder’s business partners – who illegally made over $1.5 billion in Russia did not pay taxes either in Russia or the United States but transferred this money to the United States. They contributed $400 million to Ms Clinton’s election campaign. This is official information included in their reports – $400 million. Well, it was up to them, they might have done this legally, but the gains were ill-gotten….